What do maker projects look like in each subject area? If you’re interested in designing your own makerspace, check out the Makerspace Master Course. It’s a self-paced, week-long course that you can do from anywhere at any time. This comment resonated with my own experience. The first time I heard about makerspaces, I thought, “That’s awesome and I’d love to have something like that, but I teach social studies.” I had a mental block that kept me from seeing the bigger picture around makerspaces. A makerspace isn’t just about engineering. In a previous blog post, I mentioned that every classroom should be a makerspace. 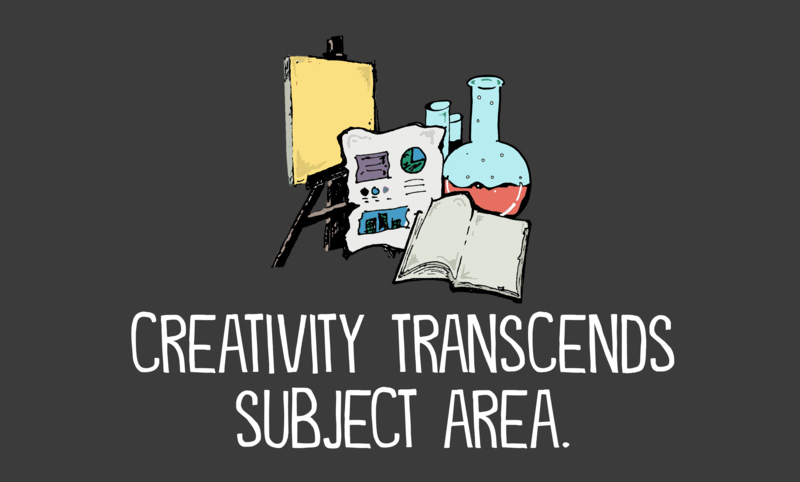 Creativity isn’t limited to STEM or STEAM or even the arts. Every time a student is designing, building, tinkering, and problem-solving, it becomes a chance to develop a maker mindset. And any time a teacher creates a space that cultivates this maker mindset, he or she is designing a makerspace. Hands-on activities. Even if there are digital processes going on, students should be engaged in some kind of hands-on fabrication. This can be lower-tech or higher-tech. Kids might make things with duct tape and cardboard or create greenscreen videos or play around with circuitry. It might look more math-related or more history-related. But the common idea is that students are engaged in meaningful projects where they are designing, building, tinkering, and problem-solving. Sometimes this involves rapid prototyping, where students have the freedom to select their own materials and create whatever they want. This is often what we imagine when we think of a makerspace. Students walk in simply play around with the items at the table. In some cases, they might know what they want to make. In other cases, the design emerges from constant iterations. Other times, though, students will engage in rapid prototyping with a twist. Here, the teacher selects the materials and the students must create something new on the spot. This is the idea behind divergent thinking challenges. The constraint pushes students to make connections between seemingly unrelated ideas and ultimately think differently about the supplies. Imagine you have a longer amount of time in a makerspace — perhaps weeks or even a month. Or maybe your students will be visiting the library makerspace on a weekly basis. Here you might decide to go with a Genius Hour approach. With a Genius Hour, students will experience some structure (often with project requirements, deadlines, or frameworks) but the goal is as much ownership as possible. Students decide the topics, the approach, the research sources, and the learning goals, and ultimately the creative work. Imagine you have only a day in the maker space. You’re not sure when you’ll get a chance to be there again and you want students to start making stuff quickly. At this point, you want to engage in quick hands-on making, where they develop iterative thinking skills. You can keep it loosely structured and say, “make whatever you want” (the rapid prototyping process) or you can say, “I want you to work within this creative constraint.” Here, students have the freedom to iterate and make mistakes as they move closer and closer to solving a problem. We often think of creativity as something loose and free-flowing. Structure can seem, at first, to stifle creativity. However, structure isn’t a bad thing if the students get to own the creative process from the original idea to the final launch. This is why I love design thinking. I’ve been using design thinking for over a decade. As a teacher, I used it for everything from coding projects to service projects to documentaries to engineering challenges. Design thinking is a flexible process for getting the most out of the creative process. It is used in the arts, in engineering, in the corporate world, at universities, and in social and civic spaces. You can use it in every subject with every age group. It works when creating digital content or when building things with duct tape and cardboard. It can even be used in planning events or in designing services. Here’s a snapshot of the LAUNCH Cycle, the design thinking framework A.J. Juliani and I developed together and shared in the book Launch: Using Creativity to Boost Creativity and Bring Out the Maker in Every Student. What Does This Look Like in Each Subject? Language Arts: For specific projects, you can do documentaries (with the green screen area), podcasts (you could do inquiry-based Curiositycasts or thematic podcasts), blogging, immersive world building (such as Minecraft in storytelling). But you can also align the Common Core ELA standards to design thinking projects. Every time they are doing research, going through ideation, and launching to the world, they are hitting specific standards. You can also integrate informational reading within maker projects by using multimedia informational text to learn how to do a beginner’s level challenge with Raspberry Pi, Arduino, or circuitry. Social Studies: Documentaries, whiteboard videos (similar to RSA Animate or Common Craft), thematic blogs, thematic podcasts, history-themed theater production (using the makerspace to do everything from set design to costume creation to multimedia elements). In economics, you can use the makersapce to do Shark Tank style projects, going through the LAUNCH Cycle to design a full project. Science: There are tons of STEM-related ideas, like solar energy designs, engineering projects, building lunar colonies, etc. FACS (Family and Consumer Sciences): I’d argue that FACS classes have been makerspaces before we developed makerspaces. The goal here, though, is to allow students to have more creative control in what they are making. Wood Shop: My friend A.J. helped his school redefine their woodshop to be a makerspace. They kept some of the best elements of the subject but they added additional levels of fabrication and had students use design thinking as an entrepreneurial framework. This is by no means an exhaustive list because making is everywhere. You can’t tie it down to a specific subject. In every profession and in every discipline, you will find people engaging in creative work. The beauty of a makerspace is that it is inherently both/and. It is both vintage and futuristic. It requires both STEM and Humanities. It is both deeply mechanical and deeply human. That’s the bold, beautiful thing that makes it so magical. You don’t have to choose one or the other.